San Bernardino, CA – Nic Granlund participated in the May 24th ITP QuadCross Championship Series at Glen Helen Raceway in San Bernardino, CA. On the first lap of the Open Pro ATV Class second moto he crashed and sustained a debilitating injury. A fund has been set up at Wells Fargo Bank for donations to support Nic’s recovery. Yoshimura equipped rider Harold Goodman has begun his 2009 bid for the Extreme Dirt Track ATVA Nationals Championship title. 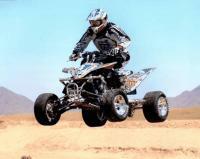 The Mountain Ridge GNCC near Somerset, PA, was a race of mixed emotions for the Can-Am™ ATV racers. In the morning, Team Warnert Racing / Can-Am's Michael Swift mounted an impressive come-from-behind victory after getting caught up in a first-turn incident. The fourth round of the AMA Pro ATV MX Championship at Danville, Virginia's Birch Creek Motorsports facility found Dustin Wimmer at the front of the pack yet again. Two-time ITP Tires/Moose Racing AMA ATV Motocross Championship presented by Parts Unlimited Champion Joe Byrd vaulted himself right back into the chase for the 2009 crown with a dominant double-moto sweep and overall win at round three of the season, the Bluegrass National, at Ballance MX in Bowling Green, Kentucky. Suzuki QuadRacer R450 ATV and Yoshimura had Another Big Weekend in Pro ATV Racing. Meanwhile over in the AMA Pro ATV Motocross world, Rockstar/Makita /Suzuki/Yoshimura phenomenon Dustin Wimmer showed up at Ballance Motocross in Bowling Green Kentucky with three straight moto wins under his belt. The ATV racing season is fully underway and Can-Am™ ATV racers are seeing much success on Can-Am Outlander™, Renegade™ and DS 450™ ATVs. The second round of the ITP/Moose Racing AMA ATV Motocross Championship was held this weekend at Mill Creek Raceway in Pell City, Alabama. For Yoshimura's Dustin Wimmer, it was just another day at the office - start strong, get the lead, win, repeat.